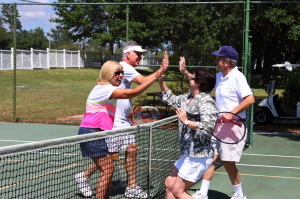 StrawBerry Ridge is a 55+ retirement community that is situated just a few of miles west of Tampa, Florida. If what you seek is a community that caters to the lifestyle needs of retirees who want to stay active and have fun all in an affordable environment, that’s what you will find at Strawberry Ridge. We are one of the best retirement communities in the Tampa Bay area and one that has an incredible location within easy driving distance of some of the state’s top attractions. Perhaps the defining feature of our retirement community is the fact that it’s a fun, affordable place to retire. There are lots of onsite amenities, plenty of offsite attractions, and a community ethos that puts a priority on deriving the most pleasure possible out of being retired. Whether you’re into taking long bike rides, swimming laps in the pool, playing tennis, playing cards, or picking up a new hobby whenever the opportunity arises, StrawBerry Ridge is a retirement community that makes it easy. The only way to truly know what life as a retiree is like at StrawBerry Ridge is to plan a visit and tour the community in person. While you’re here, you will have the opportunity to meet with current residents and hear directly from them how glad they are that they decided to live at StrawBerry Ridge. You will also be able to visit our two clubhouses, check out a model home, and just generally get a feel for what our retirement community is all about. Please contact a member of our Lifestyle Team today to schedule a visit to StrawBerry Ridge, a retirement community for adults 55 and older that’s located just on the doorstep of the vibrant Tampa, FL, area.